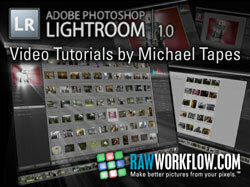 With days left to go before Lightroom is released, Michael Tapes has a series of free videos (with a higher res DVD also available for $10.95). I got to know Michael virtually through the beta testing program and am not at al surprised that the style is professional and common sense - and I learned a few things too. The streaming video is very impressive - somewhere I know Michael told me what he uses - and it almost makes me want to have a go at doing something similar myself in my Northern rasp. Hey, I could even inflict some background music on the photographic world - Joy Division, anyone? It&apos;s going to be an expensive month too - today I ordered Aperture… as well.